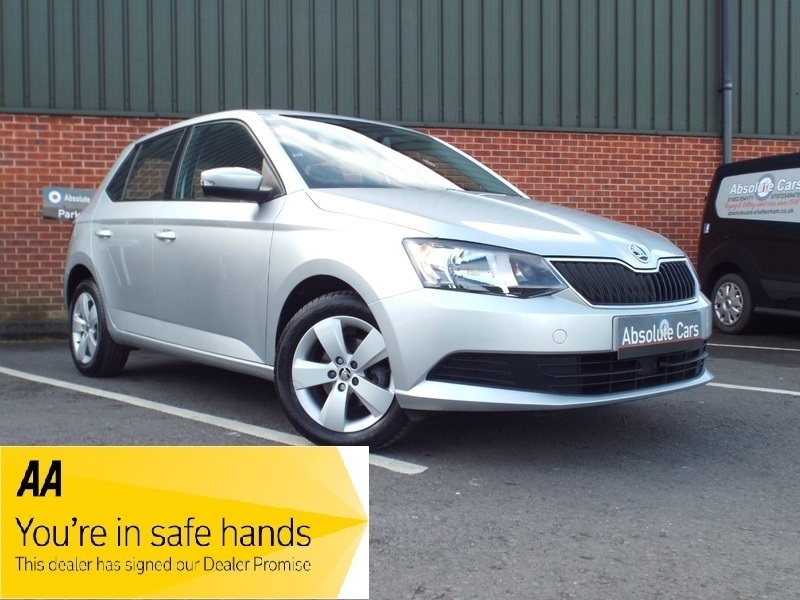 ABSOLUTE CARS have this lovely 1.0 Skoda Fabia in metallic silver with alloys & boasting rear parking sensors, Bluetooth & a multimedia touch screen. AN IDEAL FIRST CAR. Looks & drives great & only £20.00 a year tax !! Call in for a test drive, finance arranged & part exchange considered., 3 months warranty, MOT until 02/04/2020. Last serviced on 27/07/2018 at 29,706 miles, Service history, Black Cloth interior, 5 seats, Metallic Silver, 1 owner, 3 Spoke Leather Steering Wheel, 6 Loudspeakers with Arkamys Surround Sound Package, ABS (Anti-Lock Braking System) with HBA (Hydraulic Braking Assist), ASR - Anti Slip Regulation (Traction Control) with MSR - Engine Torque Control, Acoustic Rear Parking Sensors, Alarm, Alloy Wheels-15in Mato w. Anti-Theft Wh. Bolts, Bluetooth, Body Coloured Bumpers, Central Console, Centre Rear Seat Belt, Chrome Pack, DAB Digital Radio, Drivers Airbag, EDS - Electronic Differential Lock, ESC (Electronic Stabilisation Control), Electric Front Windows, Electrically Adjustable and Heated Door Mirrors, Front Assistant, Front Passengers Airbag with De - Activation Switch, Front Reading Lights, Front Side Airbags and Front and Rear Curtain Airbags, Head Restraints - Front/Rear, Heated Rear Screen, Height Adjustable Drivers Seat, Height Adjustable Passenger Seat, ISOFIX Child Seat Fittings on Outer Rear Seats, Immobiliser, Leather Gearshift Knob/Handle and Leather Hand Brake Lever Handle, Manual Air Conditioning, Maxi DOT Trip Computer, Power Assisted Steering, Radio Bolero - with Telephone Control, Mirror Link, SD Card, Rear Wash/Wiper, Remote Central Locking and SAFE Function, Steering Wheel Height and Reach Adjustable, Stop/Start Engine System, Storage Compartments under the Front Seats, Third Brake Light, Tyre Pressure Monitoring System, USB, Upholstery - Satin Black/Grey Cloth, Vanity Mirrors in Sun Visors, AS WE ARE AN AA CARS DEALER THIS VEHICLE COMES WITH 12 MONTHS AA BREAKDOWN COVER.